The Hubble Telescope jointly with NASA. The Solar and Heliospheric Observatory jointly with NASA. The landing of a probe (the Huygens Probe) on Titan as part of the joint Cassini/Huygens NASA/ESA Mission to the Saturn System. The orbiting research vessels round Mars and Venus. The Rosetta Mission to a comet including a lander. The Plank Mission to explre the cosmic microwave background – to determine the large scale properties of the universe with high precision. And many many more missions already carried out successfully and many more to come. 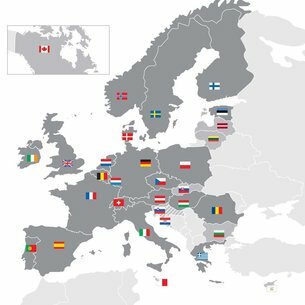 The European State Agency has 22 Member States. The national bodies responsible for space in these countries sit on ESA’s governing Council: Austria, Belgium, Czech Republic, Denmark, Estonia, Finland, France, Germany, Greece, Hungary, Ireland, Italy, Luxembourg, The Netherlands, Norway, Poland, Portugal, Romania, Spain, Sweden, Switzerland and the United Kingdom. Canada also sits on the Council and takes part in some projects under a Cooperation Agreement. Other EU states also have Cooperation Agreements with ESA, such as Bulgaria, Cyprus, Lithuania and Malta. Latvia, Slovenia and Slovakia are participating in the Plan for European Cooperating States (PECS). The map on the right above gives a good idea about how far reaching the European Space Agency is in 2015. The European Space Agency has a number of centres. One of them at Noordwyk in the Netherlands close to the coast. Apart from its role as a scientific experimental center it holds many conferences throughout the year. It is these pleasant surroundings that scientists from all over the world meet to discuss the progress of their work. 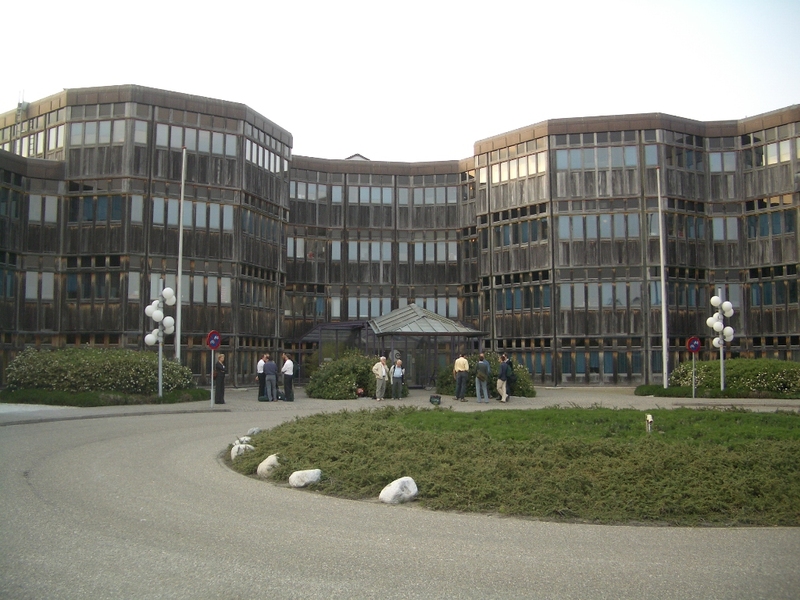 The photograph on the left show the main entrance to the ESTEC Building. 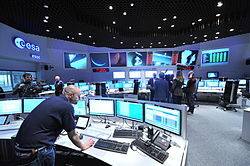 The photograph on the right shows the mission control centre in Darmstadt Germany. The Hubble Space Telescope in conjunction with ESA. Numerous landings of robotic vehicles to Mars. The Voyager Missions to the outer Solar Systems. The Gallileo Mission to Jupiter and its Moons. The Cassini Mission to the Saturn System in conjunction with ESA. The Horizon Mission to Pluto and theKuiper Belt. 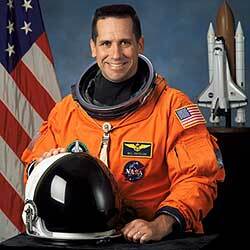 For many years the American Space Shuttles took off for the space station. We must salute the work of the many brave people who risked their lives in joining the crew of the space shuttle on its journey to the International Space Station. Tribute must be paid to the two unsucceful space shuttles which were destroyed with the loss of the lives of their crews. On 28 January 1986 Challenger broke up 73 seconds after take-of. On 1 February 2003, Columbia disintegrated over Texas and Louisiana as it re-entered Earth's atmosphere. The illustration above shows pictures of the crew of the space shuttle Discovery which returned home on 22 December 2006. 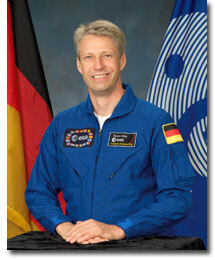 The European Space Agency Astronaut Thomas Reiter from Germany was brought back from the space, while Sunita Williams took his place. She is an American citizen of Indian descent and has been widely written about in the Indian press - both in English and in Gujarati her native language. The BBC World Service reported on 20 December that she had taken a token statue of Sri Ganeshi and a picture of her Jack Russell terrier with her into the space station. The Shuttle returned on the morning of 22 December 2006 to its base in Florida. The Russians are still very active in space research despite the limited funds made available. Many of the European Space Agency satellites and space research vessels are launched from the Baikonur Rocket site in Kazakstan. Since 1993 Russia has rented Baikonur from Kazakstan. Baikonur has been used for all Soviet and CIS manned launches and for most lunar, planetary and geostationary orbit launches. This historic cosmodrome, built on the barren steppes of Kazakhstan, is still one of the largest space launch facilities even after nearly 50 years. It has also be largely used by the European Space Agency. It should be remembered that the Russians were successful iin being the first to put a man in space. They were also very successful in actually landing vessels on the surface of Venus which lasted just long enough to take pictures on the surface before being destroyed by the fierce heat and pressure. The Chinese have a very active space progrmma and since 2013 have launched 10 people into space. The Chinese have plans for setting up a colony on the moon and sending a manned mission to Mars. The University of Hawaii has published a web-site dealing with one of the most important observatory sites on top of the Mauna Kea - 'The White Mountain'. The European Southern Observatory would be better described an observatory complex since it operates a number of telescopes in different parts of the Atacama Desert in Chile. The first site is at a 2400 metre high mountain called La Silla 600 kilometres north of Santiago de Chile. It is equipped with several optical telescopes with mirror diameters of up to 3.6 metres. The 3.5-m New Technology Telescope (NTT) was the first in the world to have a computer-controlled main mirror. La Silla remains one of the scientifically most productive observing sites in the world. 2600 m high Paranal Site with the Very Large Telescope array (VLT) is the flagship facility of European astronomy. It consists of 4 telescopes and is 2,600 meters above sea level. The VLT is a most unusual telescope, based on the latest technology. It is not just one, but an array of four telescopes, each with a main mirror of 8.2-m diameter. With one such telescope, images of celestial objects as faint as magnitude 30 have been obtained in a one-hour exposure. This corresponds to seeing objects that are four billion times fainter than what can be seen with the naked eye. One of the most exciting features of the VLT is the possibility to use it as a giant optical interferometer. This is done by combining the light from several of the telescopes, including one or more of four 1.8-m moveable Auxiliary Telescopes, three of which are now in operation. In the interferometric mode, one can reach the resolution on the sky that would be obtained with a telescope of the size of the separation between the most distant of the combined mirrors. ESO has plans to build even larger telescopes in the future such as the Extremely Large Telescope. One ESO project which is already underway in conjunction with Japan and North America is the ALMA project. There are many excellent Museums which not only have wonderful displays but carry out extensive scientific research an deliver lectures to the public. This is a wonderful Museum. It has an active programme of lectures and special displays. Full details are given in the website which is updated monthly. One look at the picture shown on the left above and which introduces its website gives an idea of what a vibrant place it is. The Science Museum tells the history of Western science, technology and medicine from 1700 to the present day through its collection of more than 300,000 original objects. The science museum deals largely with science and engineering leaving the geology and the life sciences to be dealt with by the Natural history Museum. Like the other museum it has special exhibitions and lectures. It also has an IMAX cinema. UKGE (United Kingdom Geologists Equipment) - Suppliers of a very large variety of geologists tools and equipment. Publishers of 'Deposits International Rock and Fossil Collectors Magazine'. Organisers of Field Trips. Palaeo-maps project. A truly excellent collection of Palaeogeographic maps is available on the web-site created by Chris Scotese of Texas University at Arlington. Did Venus ever have life? Could 'life' exist on Titan? Gresham College was founded by Sir Thomas Gresham in 1597 and is an independently funded educational institution based in Barnard's Inn, Holborn, in the centre of London. It has a comprehensive programme of free public lectures throughout the year on a wide series of topics including astronomy, mathematics and biology. Some lectures are held at Barnard's Inn Hall and others at the Museum of London. A Picture of Barnard's Inn Hall and the Court outside the hall are shown on the left. Many of the meetings are webcasted and can be viewed on line at the time of the meeting or afterwards. One of the most spectacular experiments of the century is the investigation of what the universe is made of and how it came into existence. 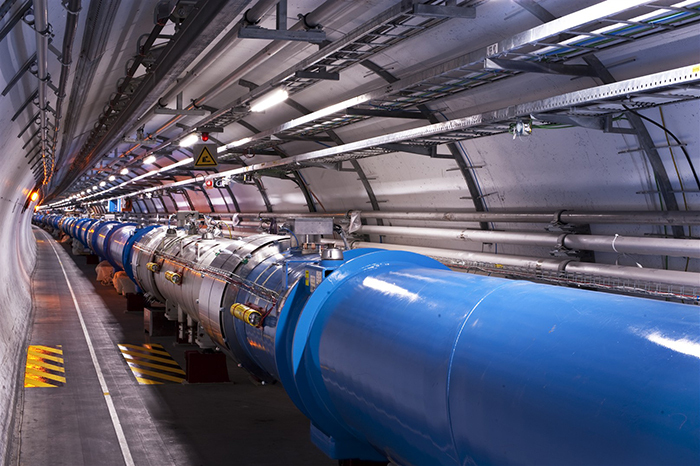 Two beams of protons in opposite directions are accelerated close to the speed of light in a 27 kilometer tunnel beneath the ground under the Swiss French frontier. The collisions create a whole host of other particles – for example the Higgs Boson which are detected in four immense detectors. In the Spring of 2015 the velocity and energy of the proton beams were increased to search for particles that may exist in theory. Soon results may find new wonders of physics.